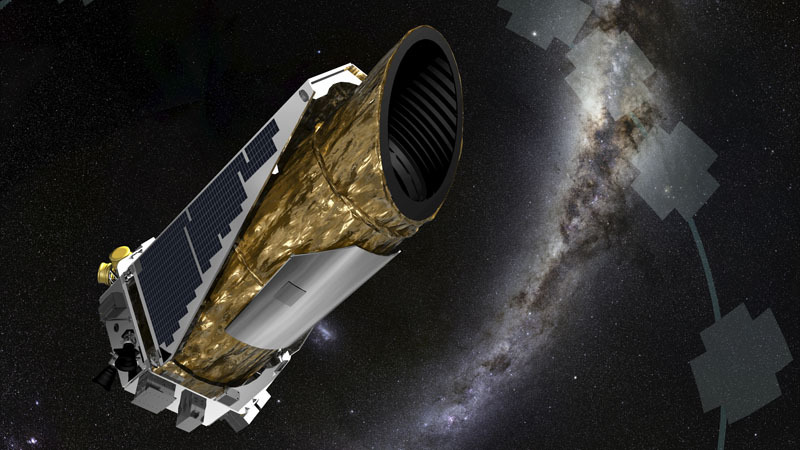 Space exploration has suffered its share of setbacks and disappointments over the decades, but few of them stung as much as the 2013 mechanical failure of the Kepler spacecraft, a space telescope designed to accomplish one of the most exciting explorations of space ever: the search for potentially Earth-like planets orbiting other stars. The Kepler spacecraft is basically a giant, very sensitive telescopic camera designed to compete in an ultimate cosmic staring contest: to gaze continuously at a patch of about 150,000 stars near the constellation Cygnus, and wait for them to blink—that is, dim slightly—when planets they might possess pass briefly in front of them. To find Earth-like extrasolar planets, Kepler had to do more than detect the very slight dimming of starlight caused by the transit of relatively small, Earth-sized worlds. It had to find the ones orbiting within their star's "habitable zone," or "Goldilocks zone:" the distance at which conditions on the planet are neither too hot nor too cold to support that commodity essential to all life on Earth, liquid water--the "porridge of life," one might say. At that distance from its star, a planet only orbits every few months, or even years, so for Kepler to confirm their existence requires it to make continuous observations for several years, so as not to miss any transits. To win the contest, Kepler could not blink. For so long people have dreamed of the existence of other planets in the cosmos, and naturally human fancy has drawn our imaginations to envision worlds whose environments would be habitable for human life. Kepler was truly the first mission of science to actually search for such worlds, an example of technology and scientific inquiry catching up to centuries of unrequited human desire. But in 2013, Kepler lost one of the stabilizing reaction wheels that allowed it to point at its target star field in the constellation Cygnus. This malfunction ended its mission to look for Earth-sized planets among those stars. And though Kepler confirmed the existence of hundreds of exoplanets—some of them of Earth-stature and orbiting within their habitable zones--during its nearly four-year primary mission, the curtailing of this exploration of extraterrestrial Earths was a soul-crushing event for scientists, if not all of us. How much more might we have learned about the worlds Kepler discovered? How many more might have been found? 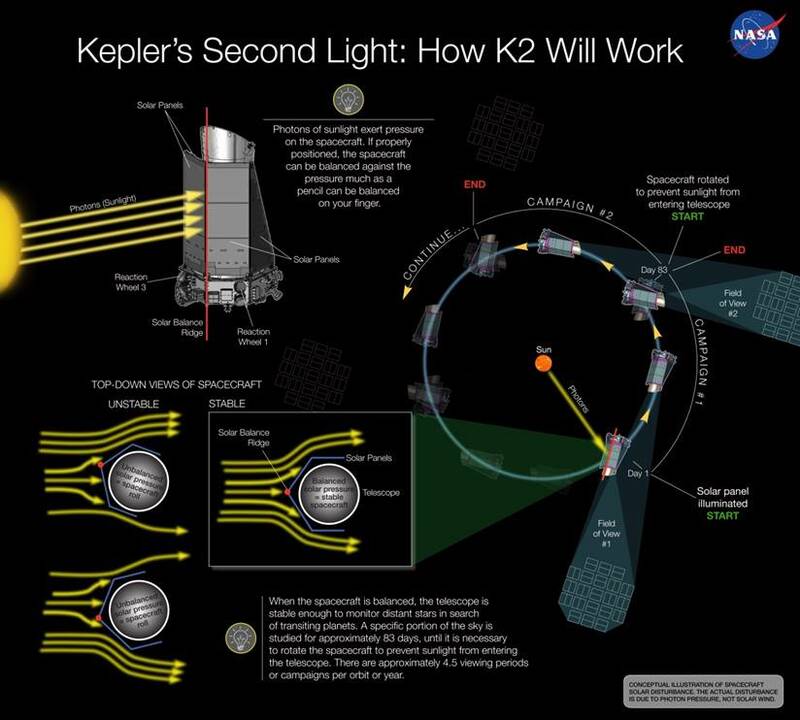 But just when it seemed that the Kepler storybook had been slammed shut after only the first chapter or two, human imagination stepped in to envision how the crippled spacecraft could be repurposed for a new mission: Kepler 2. With its two remaining functional reaction wheels and a strategic positioning of the spacecraft so that the tiny amount pressure exerted by sunlight itself is balanced, Kepler can stabilize and point to the ring of sky around the ecliptic—the plane that the planets of our solar system occupy—and last June began a new career of observation in this mode. To prevent the gradual intrusion of the sun into Kepler's field of view, Kepler 2 will be able to observe a target patch of sky along the ecliptic for about 83 days before needing to point to another spot away from the sun. But during these 83 day "observing campaigns," Kepler will bring the full force of its powerful instrumentation to bear on the objects it observes.